Coat chicken breasts with olive oil and season with salt and pepper. Place chicken on grill and cook for two minutes on each side. Reduce grill temperature to medium and continue cooking for 15 minutes or until chicken reaches an internal temperature of 165 F.
Meanwhile, in a medium saucepan, stir together beer, brown sugar, honey and Worcestershire sauce and bring mixture to a boil on high heat. Stirring slightly, reduce temperature to low and simmer sauce for an additional 25 minutes or until sauce is reduced by half. Glaze will continue to thicken as it cools. Remove from heat. 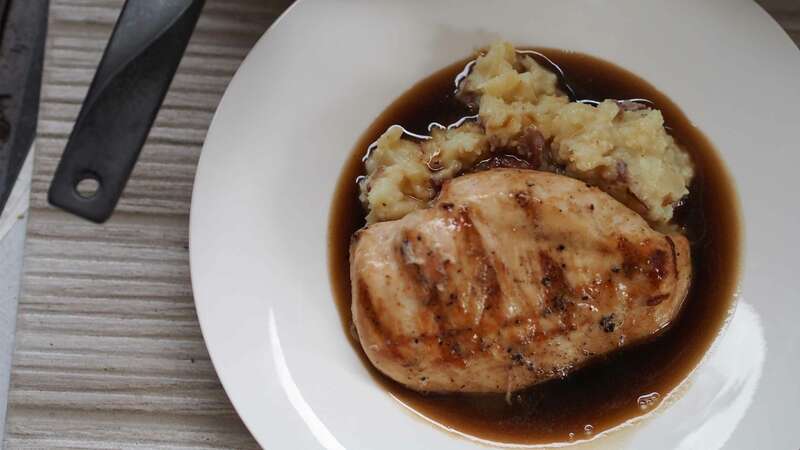 Plate chicken with mashed potatoes and serve sauce over chicken.